A 60 y o female brought to casualty with altered sensorium. Bilateral cerebral cortical restricted diffusion in fronto temporo parietal region and cingulate gyri. Characteristically occipital region and peri rolandic cortex spared. Changes are not marked on FLAIR. Imaging wise DDs suggested were Hyperammonemia and Encephalitis esp Herpes. Pts serum ammonia level was 90 mcg/dl ..high (Normal serum ammonia level is 35 to 65 mcg/dl) consistent with Acute Hyperammonemic Encephalopathy. • Hepatic encephalopathy, Hepatic coma, Hepatocellular disease, Portal hypertension. • CCF with congestive hepatomegaly. • GI bleeding and/or obstruction with mild liver disease. • A genetic metabolic disorder of the urea cycle – late onset ornithine transcarbomylase deficiency. • Erythroblastosis fetalis of the newborn. Milder forms, signs of encephalopathy may become evident at any age ranges from vomiting, abnormal mental status, ataxia, seizures. The pathophysiologic mechanism of central nervous system injury in hyperammonemic encephalopathy is not completely understood. Believed to be intracerebral accumulation of glutamine is the major cause of the encephalopathy. 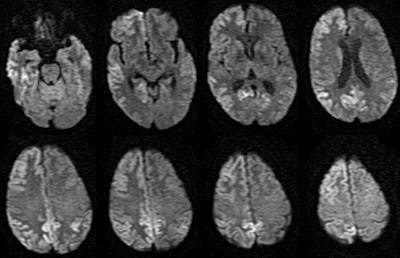 The signal abnormality on MRI diffusion is attributed to hypo perfusion secondary to hyper ammonemia. Changes are usually confined to cerebral cortex, especially the cingulate gyrus and insular cortex, with sparing of the perirolandic and occipital cortices. It is presumed that the cingulate gyrus and insular cortex may be particularly vulnerable to Hyper ammonemic - hyper glutaminergic encephalopathy with the peri rolandic and occipital cortices being relatively resistant. Cerebral Cortical Atrophy reported in long standing cases.